Between all sorts of weirdness with work (received a job offer, then the offer was rescinded, then there was a different offer - just all sorts of craziness) and marathon training (so tired, so hungry, everything hurts), this summer has felt like a whirlwind. So much so, that I chose to limit my time on the internet. I've been spending my summer running, working, eating, running, cross training, running, working, doing jigsaw puzzles, sleeping, and running. Ragnar was an experience. It was my first time running a Ragnar Relay, but I had heard about this relay series before from friends and from running bloggers, and it always looked like a lot of fun, so it wasn't too difficult of a decision when I was approached by a friend who was putting together a team. 12 people. 2 vans. 200ish miles. Good times! Each runner runs 3 legs of the race, and mileage can vary greatly for each leg, so some runners will end up running more than others. You really get to know people well when you are running with them and spending the entire weekend together in a van. Although we had a lot of fun, enjoyed the scenery (running somewhere new was amazing - and my night run was pretty much the best thing ever), and were happy that we ran the relay, we did experience all sorts of problems. The weather was unusually hot and humid, which caused problems for everyone, slowing people down and creating some dangerous conditions for the longer legs. I got sick shortly after finishing my first leg of the race. We experienced a lightning delay when a surprise series of storms rolled in and there was very little communication from the race about how to handle things. And, the big one for our team, one of our vans broke down, stranding 6 of our runners and causing them to miss their 2nd round of runs. Even with all the problems, we still finished! Would I run Ragnar again? I think so. Now that I know what to expect, I would be better prepared for the craziness. I would pack lighter, plan food better, and would train for the race rather than relying on my training for other races that happened right before or after the relay. Proud to Run was my first 10k, and it has become a bit of a tradition for me, so I knew that I would be running the race again this year. I love that it is entirely volunteer organized and run. There was lots to see and do both before and after the race, with various sponsor/vendor tents set up, a group warm up before the race, and post race entertainment. As was to be expected for a summer race in Chicago, it was hot and humid. I ran, hoping for the best, but I was still having problems with my legs and feet, so I ended up having to do run/walk intervals throughout the race. My finish time? 1:12:38, giving me an average pace of 11:42, which is much much much slower than my usual 10k pace. I was slow, but I finished. And sometimes you need to celebrate even the small accomplishments. Why do I continue to run this race every year? It is well run, the volunteers are awesome, the other runners are some of the nicest and happiest that I've encountered, it benefits worthy causes, and it is just a lot of fun. Finally, we have the Esprit de She 5k. Another tradition. Another hot and humid race. So hot this year, that the 10k that was supposed to accompany the 5k was canceled shortly before the race began, so all runners ended up doing the 5k. So hot that for the first time since I started running, I seriously considered not running a race for which I was registered. A friend and I convinced each other to still go to the race, planning to walk it if needed. The heat index was well over a hundred degrees when I arrived at the race site. There were multiple announcements about the heat encouraging runners to slow down, walk if needed, and take advantage of the water stations. I don't think I have ever moved so slowly in a race before. I ended up having to walk a lot more than I ever have before because I kept feeling sick. I have some amazing friends, though, and they walked with me and kept me moving. I finished with an average pace of 13:55. I'm glad I finished, even if it was with my worst ever 5k finish time. 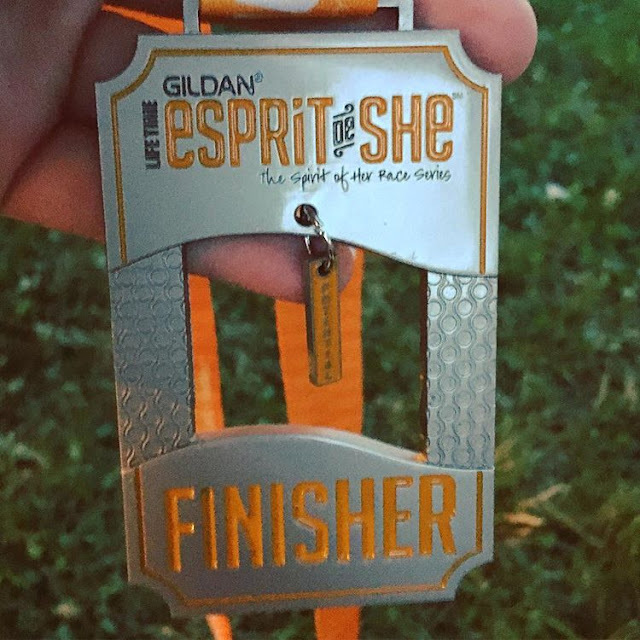 I've been feeling really down about running before the race, and even the simple act of making it across the finish line felt like a huge achievement. They had ice cold wash cloths, bottles of water, and, best of all, popsicles at the finish line. Sadly, due to unfortunate timing, my friends and I didn't get to enjoy the post race party. My slow finish meant that I made it to the party just in time for it to be canceled due to a quickly approaching thunder storm. 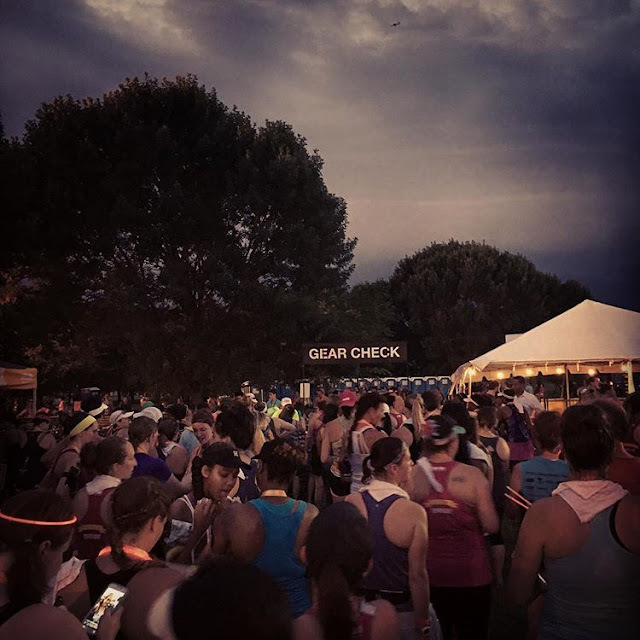 I felt a little bad for my friends, because I really played up how great everything at the finish line was - bubbly bar, snacks, swag, and after party - and because of me we finish too late to take part in the post race festivities. We got our bags from gear check and then parted ways as we tried to beat the storm. There were already strong winds, and we could see lightning and hear thunder. I made it to the bus just a second before the downpour started. As usual, the Esprit de She was a really well run race. All of the problems (canceled distance, canceled post race festivities, etc) were due to problems beyond the race's controls. They did a great job in communicating everything clearly to participants and making sure that everyone was safe. I'm not sure if I will run the race again, but that is more because I've learned that I don't do well in the heat, and this is a summer race. Boom! Quick and dirty race recaps! I won't slack off in the future when it comes to recaps, but I do feel better having gotten these out of the way, even if they aren't very detailed. I did a lot fewer races than usual this summer because I've been concentrating on marathon training. I've learned that heat and humidity are not my friend, so summer and I don't tend to get along well. i ran the ragnar road relay in 2014 and the ragnar northwoods trail relay this year. i thought the road relay was fun but i LOVE LOVE LOVED the trail relay so much more! you should look into it if you like trail running at all. it was absolutely beautiful and i enjoyed the experience so much more than the road relay. there is no doubt that i will do northwoods next year if i can.